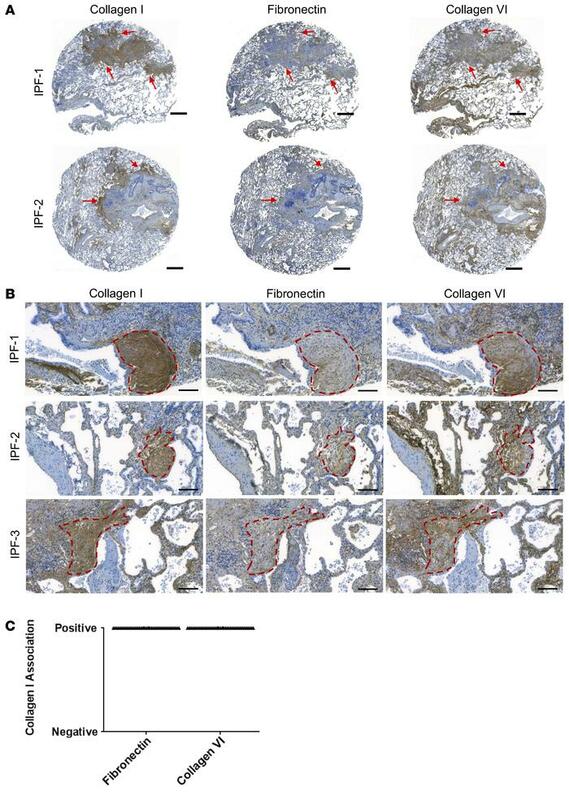 Distribution of fibronectin and collagen VI in the fibroblastic focus. (A and B) Twelve IPF specimens were assembled into a tissue microarray, serially sectioned at 5 μm, and immunostained for collagen I (left), fibronectin (middle), and collagen VI (right). (A) Low-magnification images of 2 IPF specimen serial section core punches. Red arrows show regions of high collagen I deposition traced through the serial stains. Scale bar: 500 μm. (B) High-magnification images of 3 IPF specimens. The myofibroblast core of the fibroblastic focus is outlined by a red dotted line. Scale bar: 100 μm. (C) The myofibroblast core of the fibroblastic focus, characterized by collagen I immunoreactivity, was scored as either positive (score = 1) or negative (score = 0) immunoreactivity for fibronectin or collagen VI. Each myofibroblast core was serially immunostained up to 4 times for fibronectin and collagen VI, and their averaged score is represented as a single data point on the graph. A χ2 test was performed for fibronectin and collagen VI association with collagen I; P = 0.9999 for both (n = 41 fibroblastic foci for fibronectin, n = 41 fibroblastic foci for collagen VI; n = 9 IPF patients total [2–8 fibroblastic foci per patient]).